Today I am going back to the flower heads for a bit. 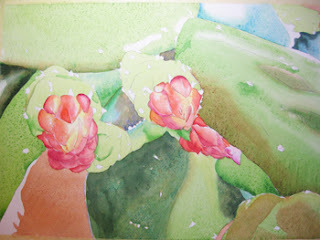 I have added Permanent Alizarin Crimson to the shadow areas of the flower heads. I worked patiently all around the flower heads, softening some edges and leaving the crisp lines at the darkest edges of the shadow shapes. Try experimenting with different reds on your palette. Some reds are cool in temperature, like Alizarin Crimson. This pigment has a hint of blue or purple and it works really well in shadow areas of red objects. Other reds like Winsor Red are more warm in temperature an have a yellow-orange cast to them. The are more appropriately used in areas where the sun or light is shining on an object. Next, I have used Prussian Blue (very wet) in some more shadow areas. This is a very strong color and should not be used too heavily. It will deaden your painting if it is overused. I like to try to keep my glazes transparent, even when developing strong, dark values.